On our first Disney cruise we were puzzled by the decorated hanging pockets hanging outside staterooms. On our second Disney cruise we joined a Facebook group and learned about Fish Extenders - a way of exchanging gifts with your fellow cruisers. You sign up to participate and swap presents with ten or so other cabins, and the gifts are delivered to a receptacle which you hang outside your stateroom door. The gifts can be large or small, something to use on the cruise or a souvenir to take home, and are generally Disney themed. 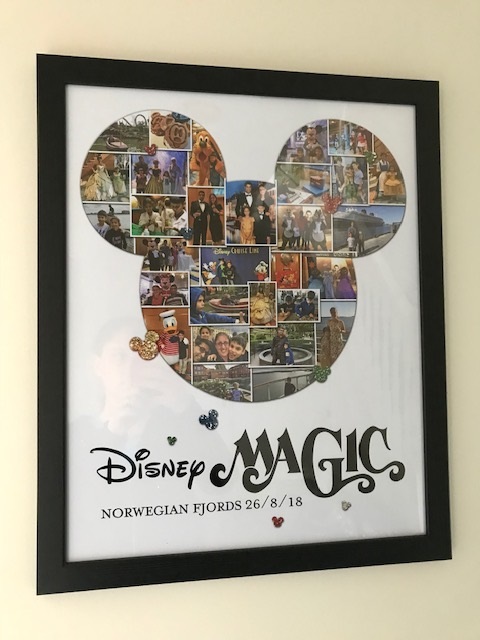 On our third Disney cruise I came very close to signing up, but chickened out in the end after I joined a Fish Extender Facebook group and was overwhelmed by the generous gifts that people were preparing. I still wanted to join in somehow though, and a few days before the cruise I spotted a sign up list for a Pixie Dust exchange. It was a list of people that were interested in giving and receiving Pixie Dust, with no obligation. This appealed to me a lot more because I knew that I could make up lots of little gifts, but with only two days to prepare I was a little pressed for time, and I decided to do my best to gift everyone on the list but with something small. I settled on a pack of chocolate buttons, a coloured pen and a glow stick. Unfortunately, even though I was very careful the glow sticks were a fail as most of them snapped before we even got on the ship - whoops! Next time I would pack them separately in a sturdy box and assemble just before handing them out! 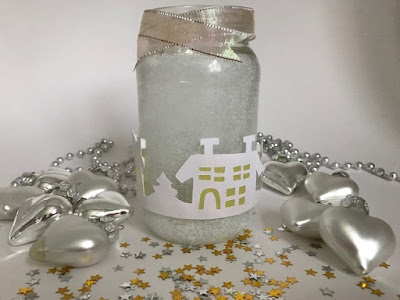 I tied them up with some ribbon and a free printable Pixie Dust gift tag that I found. I also spent a good few hours making some little magnets which were much more successful. I used a picture taken on a previous cruise at a port we would be visiting again and added a cruise line graphic, the date, and the Danish and Norwegian flags. Each magnet measured about 6cm across. I cut them out, laminated them, cut them out again, and glue a small piece of magnet to the back. I ended up with over 60, and we had fun on the ship walking the corridors and selecting our favourite doors to add them to as a little surprise for the inhabitants. I hope that they were pleased to find them! When I got back I was thrilled to find that I had been lucky enough to win a Disney collage design offered by one of the other members of the Pixie Dust exchange! This gorgeous collage is by Saffron Rose Designs and I just had to mention it because we were so pleased with it, it's a lovely way to display our favourite photos. We are hoping that we will be able to go on another Disney cruise next year, and this time I'm planning to step it up a level and join in with the full Fish Extender exchange, as well as making more magnets to hand out and probably some Pixie Dust too. It's just a case of fitting it all into the suitcases! I've found a blank door hanger to customise, and while I'm not quite sure where to start, there is plenty of inspiration online. I'm thinking about decorating each pocket with our favourite character, although I'm not sure which to choose for mine! If you want to know more about the extra magic that a Disney cruise offers you might enjoy my guest post for Cruising with Kids - Top Tips for Cruising with Disney and Life Onboard a Disney Cruise. Our our cruise over the summer holidays we docked for the second time in Stavanger, Norway. Stavanger is the sixth largest city in Norway but it doesn't feel like a city at all. The town centre is compact, very walkable, with lots to see and do. Next to the harbour is Old Stavanger, a collection of small, white wooden houses built around 200 years ago and set amongst pretty cobbled streets filled with museums, galleries and small shops. Well, the houses are almost all white. What's that down at the bottom right of the photo? This little blue house caught my eye as soon as we docked and looked out over the city. It's right opposite the cruise ship dock, nestled among the white wooden houses, showing its own personality. I fell in love with it straightaway. It's such a pretty house, in such a beautiful location, and I do love Stavanger. I can imagine myself living here, sitting by the window with a hot chocolate, riding my bike to the shops, wandering the cobbled streets, smiling at the tourists, and in the evening retreating to a little bedroom under the eaves with a book. Of course in reality I know nothing about this house. I can guess that the view from the front window isn't the best, as the gorgeous view across the harbour would be blocked most days by at least one cruise ship docked literally right outside - you can see ours reflected in the windows! You probably also get lots of curious tourists like me wandering up to snap photos and peer through the windows. Being part of Old Stavanger there would be the obligation to keep the house looking nice for the tourists, and I'm sure that a 200 year old house has many more problems than our new build. But I can still dream, and if we should happen to return to Stavanger I'll definitely be checking to see if it's still there! 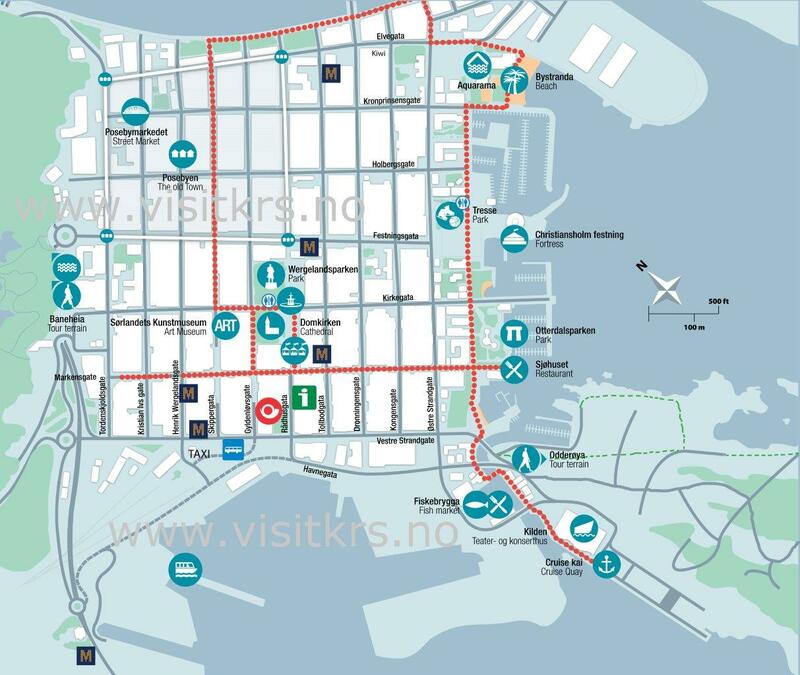 If you find yourself in Stavanger, and I hope that you do, you might enjoy my post about things to do in the port of Stavanger. On our recent cruise we spent a day in Stavanger, Norway, and I mentioned to Harry, almost without thinking, that this was one of my 'happy places' around the world. It reminded me of some of the other places around the world that I've been lucky enough to visit, and some of them stay so firmly in my memory as places that I feel happy, at peace, and I'd love go visit again and again. So I thought I'd share with you some of my happy places, and why I love them so much. I've already mentioned Stavanger. Possibly one of the reasons that I love it is that I have visited it as part of a cruise, which has already put me in an excellent frame of mind, but it's a lovely city, everything is in walking distance, and the houses are lovely. I think I could happily live here! Bryce Canyon in Utah is an American national park. I fell in love immediately with the distinctively shaped orange rocks, contrasting with the blue sky and the green trees, but it became even more special as it is where Ram proposed. I'd like to take the children there one day, and see if we can find our way back to the same spot. Castaway Cay is Disney's private island in the Bahamas, which you can only visit as part of a Disney cruise. It's just lovely - gorgeous calm blue sea, soft sand, lots of activities to keep children busy...it really is paradise. I bought a key ring on our visit that I keep on the keys to the garage, and in winter when I'm braving the trip outside to put the washing in the dryer it reminds me of our fabulous day there. I hope I'm able to visit again one day! Center Parcs has been one of our favourite holiday destinations since the children were tiny, in fact it was our first holiday with Harry when he was just four months old. I love arriving at the lodge in the forest, unpacking, and then sending the car away for the next few days. The lodges are so cosy, the swimming pool keeps everyone entertained and tires them out, and there is plenty of forest to explore. Port Campbell in Victoria, Australia, is one of many popular stops along the Great Ocean Road drive. I loved Australia in its entirety, but even though we were only in Port Campbell for one day amongst many other stops, there was something about the town. My memories are getting hazy and I'm sure it has changed a great deal, but I remember a beautiful sandy beach which was enclosed on each side with cliffs, and going for a walk along it in the evening. There was also so little light pollution that you could see the stars really clearly and it was such a peaceful and relaxed place. Finally, there is at least one of my happy places that I can visit pretty much as often as I want to. Goring Beach, Worthing. I love it here at all times of the year, the pebbles that you can sit on without needing to get rid of sand afterwards, the winds and the kite surfers, walking along with beach on one side and grass on the other listening to the sound of the waves. I also have many happy memories of times spent here with family and friends. Where are your happy places around the world? Are they ones that you can get to easily, or do you need to hope you can travel back there someday? If you are looking for ideas to fill your blog editorial calendar for the foreseeable future then look no further - here you can find plenty of ideas to inspire you with seasonal themes that will suit blogs of any niche. 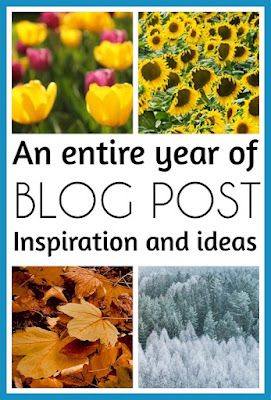 There are plenty of blog post prompts and inspiration for Spring, Summer, Autumn, Winter and Christmas themed blogging. I hope that you find them useful! * A list of ten things that you love about Spring - a great way to make you feel happy and positive! * Share a garden update at the start of the year - what is growing at the moment, can you spot any signs of Spring? * What are your garden plans for this year? You could also write about growing things on the windowsill, your allotment, or a garden of a friend or family member that you love. * Share some photos from a walk that you take regularly, for example the school run or the walk to work, and notice the changes. This is a good one to update throughout the year as we go through the seasons. * What other things do you Spring clean? For example, do you Spring clean your blog, your calendar, your business? * What is going on locally? Share details of Farmer's Markets, open lambing at local farms, Easter Egg hunts. If you visit something you could write an individual review, or list a roundup of activities, perhaps themed by type, location or audience. * Share a Spring or Easter themed craft - whether it's something to do with the children or making some seasonal decor for your home. * Share a seasonal recipe or two using fresh ingredients to suit the season. * Look ahead to the summer holidays, what do you have planned? What are you most looking forward to? * Share some Spring flowers that you've bought recently, great for some pictures for social sharing too. * Does what you eat and drink change as the weather gets warmer? What are you looking forward to eating or drinking this season? * If you've been having a Spring declutter or clearout, share some of the treasures that you've discovered while you've been hunting through the basement or attic, like old school work, sticker collections, or other sentimental items. * Share your favourite summer recipe - a barbecue staple, a refreshing drink or your best summer cocktail. If you have published posts already over the last few years you can create a roundup of themed summer recipes to get some new views back to your older content. * Share a garden update, a balcony update or even a windowsill update with pictures of what you can see from your window. What has changed recently, what is growing, do you have a beautiful tree or flowerbed to share or is the garden full of summer toys. * Summer home decor picks - a good place to add some affiliate links if you have any, perhaps choosing items along a theme like the beach, nautical, sunflowers and so on. You might have review items to include that would fit well with the theme. * Write about a summer walk somewhere, and contrast it with a visit at different times of the year. For example a summer walk along the beach, a summer walk through some local public gardens or through the forest. What is special there at this time of year? Take lots of photographs! * A summer activity list - a list of all the things that you want to achieve this summer. Also a great resource for bored children during the holidays! * What happens in summer where you live? Are there any special events locally? Share a list of local activities like pick your own or car boot sales, or showcase something bigger like the International Bognor Birdman or the Eastbourne Air Show. If you write about an event, make sure to share your post on the appropriate Facebook page or with the Twitter account. * Write about some of your favourite summer memories from childhood. What do you do now to create fun memories with your children, are they the same things or different? * Summer tips and hacks - How to keep babies cool, what to pack for a picnic, what you need in your hand luggage on a flight and so on. Everyone has advice to share! * Free summer holiday fun - How to find out about free local activities and some ideas for things that you can do at home to save money on expensive day trips. * What has been the summer craze where you live? There always seems to be one or two, whether it's loom bands, fidget spinners, Lego cards or Pokemon Go! Have your children been obsessed by anything recently? * How has the last school year been for your child? What did they achieve, what milestones did they reach, what fun things did they do? How do they feel about moving on to the next year, especially if they will be starting at a new school. * How does your routine change over the summer - do the children stay up later, do you eat dinner outside, does what you eat change? Do you enjoy being more flexible, or do you prefer the routine of term time? * Carry out an interview with your child at the end of the school year, perhaps comparing a photograph of them on their first day with one taken on the last day. This also makes a good vlog and creates great memories to look back on. * Are you going away on holiday? Write a preview post about where you are going and what you hope to see and do. You could ask other bloggers for their tips about a particular location to make a helpful crowd sourced post. * Write a review of your summer holiday destination. Include useful information to help people that might be planning their holidays, and remember to re-share in January when people are booking for next year! It doesn't need to be a press trip as people will value your honest opinions and photographs. If you managed to save money when booking share your tips, and write a list of packing essentials. * Blog a summer craft, either for kids or for yourself. If you have blogged about a few you can combine them into a summer craft round up post. * Make a list! Choose ten (or more!) things that you love about summer, about the warm weather, the light evenings, about the school summer holidays, favourite summer foods, favourite places to visit locally. * A review of a local attraction, with plenty of factual information and perhaps a video. * Summer garden ideas and inspiration - some things you've done to make your garden pretty, share a Pinterest board if you have one, reviews of garden equipment that you've purchased like play or cooking equipment. * A summer holiday travel wishlist - where would you like to visit in the summer holidays? For how long? Or do you prefer to travel out of peak season? * Before the memories fade, it's a good opportunity to reflect back on the summer. You could share some of your favourite summer photos, and remember some of the fun things that you got up to. This could be done as an interview with children, asking them about the things that they enjoyed the most. * Did you travel anywhere for summer this year? Now is a good time to think about what you enjoyed, what you didn't, and make your travel plans for next year. * As the children begin a new school year it's a good opportunity for a catch up. You could write about how the children have changed since last September (perhaps along with some photos to compare) and what you hope the new school year brings for them. This could be done in an interview style, asking questions about their favourite school subject, what they hope to be when they grow up, and so on. * Do you have any school tips to share with new school parents? Essential items for schoolbags or perhaps some packed lunch ideas, as well as helping children settle down and make friends. * Has September brought a new change in routine now that the children are back at school? Do you have a little one that has started school for the first time and you finally have some extra time to yourself, or are you back at work after a summer break? How do you feel about it? * I always find September a good time of year for a new start and new resolutions. Do you have any goals that you want to accomplish before the end of the year? Similarly it's a good time to catch up with those New Year's Resolutions and see how they are going! * One of my favourite things about going back to school was always new exercise books and new stationery. You could do a roundup of the favourite things that you've bought for your children (or yourself!) this new school year, or a round up of new bits that you've spotted. * As the evenings start to draw in it's fun to think about making your home more cosy for winter. You could pick out some seasonal decor for your home, like cosy throws and comfy cushions with an Autumnal theme. * You could also do some seasonal wardrobe picks and share some of your favourite Autumnal clothing pieces. * It's a great time to share Autumn recipes, using seasonal ingredients, that are warm and comforting, for example my Spicy Butternut Squash Soup. If you have published several on your blog over the years then you might want to consider publishing a round up so that readers can easily find them all in one place. * Similarly, what are your favourite Autumn ingredients for cooking and baking? We have an apple tree in the garden, and I love trying out new apple recipes. Many years I manage to grow a pumpkin, and I love making pumpkin soup. * Before the weather gets too cold, plan a visit out and about to see the beautiful natural Autumn colours. Write about a family or solo trip to the forest, and collect plenty of fallen leaves to use for crafting when you get home. * There are lots of other natural things that you can use for Autumn crafting - like conkers, acorns, pine cones. See what you can come up with, and share the results on your blog. It's also a good opportunity for a round up of Autumn crafts, either sharing your own or choosing posts from other bloggers to share. * Write a list of your favourite things about Autumn. You also could ask friends and other bloggers for their own favourites to add to your list. Great to look back on too when the cold dark evenings are in full swing! * Think back to some of your favourite Autumn memories. Did you have any back to school traditions, a place that you always visited as a family to collect Autumn leaves, or a favourite meal or drink that you enjoyed with family or friends. * I'm not a coffee drinker but I've noticed that everyone seems very excited about the yearly launch of Starbucks' Pumpkin Spice Latte, are there any other seasonal releases that you look forward to? * On the 5th November in the UK we celebrate Bonfire Night - you could write about Bonfire Night memories and how you celebrate with your children. * You could write a round up of firework displays in your local area to help people planning trips out (you could share it to local Facebook pages or groups), or write a review of a display that you've been to. You could share safety tips, or tips for visiting a fireworks event with young children. * Also in Autumn comes Halloween, do you mark the occasion with your family? Do you go trick or treating or host a party at home? How do you carve your pumpkins? Share some of your favourite Halloween memories and traditions. * Do you decorate your home for Halloween? Share some of your ideas, or share photographs of houses in your area with the best decorations. * If you are hosting a Halloween party, share some Halloween party food and costume ideas. This could be homemade, or things that you've picked up or spotted in the shops. * If you have published lots of Halloween posts over the years you could consider a Halloween round up to bring new eyes to older posts. * What do you love about winter? A great way to share some positives if this isn't your favourite season. * What do you hate about winter? What can you do to make yourself feel better about the parts that you don't like? * How do you know that winter is on the way? What are the first signs? * Where is your favourite place for a frosty Winter walk? Share some photos! * Share a recipe for your favourite winter meal or comfort food, using seasonal produce if you can. * Share your favourite warming winter drinks, whether a classic hot chocolate or something a little stronger. * How do you make your home cosy for winter? Do you change your decor to match the season? * What are your favourite winter outfits - share your cosy knitwear picks. * Do you decorate your home for winter, not just Christmas? Share your ideas and inspiration. * Share some favourite winter family films to snuggle up together with, or books that you enjoy reading at this time of year. What other hobbies do you associate with winter? For me it's a jigsaw puzzle or two! * What is your winter travel wish list? (you can see my winter travel wishlist here!). Where would you love to visit that is especially beautiful during the winter. * Tips for keeping warm, both at home and out and about. * Write a winter themed poem or short story to share on your blog. * Share your top winter gear picks for the family - snowsuits, wellies, hats and so on. * Cheer yourself up with some sunny memories - share some pictures from your last summer holiday and share plans for the next one. * If you have a few winter themed posts from previous years then combine them into a round up - for example crafts, recipes, days out. * Did you write any blog posts over the last year that could do with an update? For example a home renovation project, moving house, a new addition to the family - share how you've been getting along. * Write about a television series or two that you've been binge watching lately under the blankets. * What do you do in that period between Christmas and New Year? Do you stay at home eating chocolates, or is it a time to visit friends and family or get out and about in the fresh air. * What are your New Year's resolutions and goals? How did the ones from last year go? What could you change this year to improve your success? * Do you have any New Year's decluttering or organising tips or hacks to share? * What were your top performing blog posts of the last year? Why do you think they were so popular? How could you replicate their success for the future? 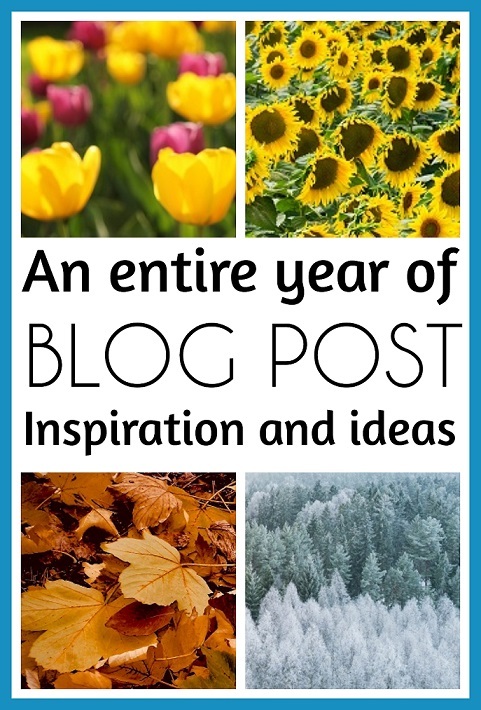 * What were your favourite blog posts from the last year? Why? * Looking a little way ahead, perhaps you have some Chinese New Year or Valentine's Day posts that you could start to write and schedule in for January - recipes, crafts and so on. * Review a local Christmas attraction - whether it's a big trip to see Father Christmas or just a visit to the local garden centre. Share information and tips with readers that may be planning their own trip either this year or in the future. * Share your favourite seasonal recipe using seasonal ingredients if possible. * List your favourite Christmas songs, you could even embed the videos from YouTube and share your reasons for choosing them and what they remind you of. * Favourite Christmas films - both recent ones and ones that you remember from when you were little, ones that you want to share with your children. * Give readers a tour of your Christmas tree and share some of your favourite ornaments and decorations, what is the story behind them? * Share a Christmas craft or two. If you've shared several in the past you might have enough for a round up. * What Christmas traditions have you started with your own children? You can readabout our traditions here! * If you've been blogging for a few years, link back to some older posts. For example you can see the evolution of our gingerbread houses over the years. * There are plenty of controversial Christmas topics that you might have an opinion on, so keep an eye out in the news and parenting groups to see what people are talking about. For example, do you limit the presents that you buy for your children or do you go overboard? How do you split present giving between family and Father Christmas? * Interview your children with some Christmas questions, for example 'what time will you be getting up on Christmas morning' and 'what do you think Mum or Dad would like for Christmas?' Share their answers, and then tag some other bloggers to join in asking their own children. Really fun to look back on each year! * Who are your fantasy Christmas dinner guests and why? * Gift guides - the possibilities are endless. Ideas for yourself or other family members, gifts for a particular hobby or interest (for example, gift ideas forcrafty Mums), gift guides with a particular theme (for example Minecraft or Pokemon). You don't need to feature review products, and in fact it's better to include items that you already own so that you can recommend them honestly. It's also a great way to add some affiliate links. * What are your favourite seasonal treats, foods that you only buy and eat at Christmas? * Are there any places near you to visit to see some awesome decorated houses? Take the reader on a tour of your neighbourhood through photographs and video. Photo credits - tulips by Steve Enoch, sunflowers by Marco Secchi, autumn leaves by Hanne Hoft Bidtnes, winter trees by Atle Mo, Christmas foliage by Annie Spratt, all via Unsplash. On our recent cruise to the Norwegian Fjords with Disney we stopped for the day in Kristiansand, Norway. Kristiansand is the fifth largest city in Norway, and it's a popular spot for tourists. The cruise ship dock is close to the centre of town, and it's a very walkable city. If you have a day to explore Kristiansand, I would recommend taking a walking tour of the city. If you stop a few times on the way it will take you several hours, and there is plenty to see. I used this printable map with a suggested walking route, and we were given a copy of a very similar map as we left the ship. We started our visit at the Fish Market. Mia is always asking what my favourite colour is and I never know what to say, but having visited Kristansand I've decided that it's the beautiful yellow ochre that is characteristic of many of the buildings here and elsewhere in Norway. It looks so lovely against a bright blue sky. The fish market is quite small and aimed more at locals, as cruise ship passengers aren't going to be buying fish to take back aboard, but it's interesting to have a quick look around and see what's on offer. Then we followed the path around next to the harbour. The walk takes you through some lovely park areas with fountains and flower beds and you can admire all the boats out in the marina. There are also several playgrounds along this stretch and we spent quite some time here. The children always love a playground in a different country where the equipment is different to home. We also stopped for a while at the Beach, a wide and almost empty stretch of sand with some lovely views out to sea. We collected sea glass and the children played in the sand. On our way to the beach we passed Christiansholm Fortress, built in 1672 to defend the city. It's quite small but rather pretty and guided tours can be arranged. The views across are lovely and it felt so peaceful. As we continued around the headland there was quite a lot of construction going on, from the look of it mainly luxury apartments. There's also a sea swimming pool with a viewing area and steps down, although it was a little cold for swimming when we visited! As we walked along the river north of the city I kept stopping as I heard loud splashing in the water, it wasn't until we reached an information sign that I discovered it was salmon, and we stopped for a while to eat our lunch and look out for them. Then we headed down through the Old Town and into the centre. We stopped to admire the Cathedral and had a quick peek inside, before stopping in some of the inevitable souvenir shops to spend the children's pocket money. Before heading back to the ship we took a short walk up to Odderøya, a formal naval base and now a recreational area. You can take a longer walk if you choose for views of the harbour and fortress, or just take a quick stroll. On our way back down we stopped to see the boats at the Museum Harbour, a free attraction with some historic boats to look at and information signs. We really liked Kristiansand, and it was the perfect place to spend a few hours exploring. If you don't fancy travelling further afield or doing a guided excursion it's really easy to find your own way around and there's plenty to keep you entertained for several hours. My children love Minecraft and they love Hama beads - and Hama beads are the perfect craft material for reproducing the blocky feel of Minecraft! So I'm sharing some brilliant Minecraft crafts made using Hama beads. Of course you can also use Perler beads or any other type of melty bead to make these designs. We made these Minecraft Hama bead keyrings to go in party bags for my son's Minecraft party a few years ago, and they were a big hit! You can find some designs similar to the ones that we used here - Minecraft designs for Hama beads - and they can also be adapted for all sorts of crafts. For example we used similar designs to make square magnets to sell at a car boot sale. You can also find some different Minecraft keychain designs in the video below, these keyrings are all different types of weapon. To make similar keyrings you can find a free pattern from Red Ted Art here - Hama bead Minecraft sword pattern. I love this Minecraft sign using Hama beads which makes a great room decoration. You could also adapt the letters to spell out your child's name as a sign for their door. I used the small Easter egg board to make these Minecraft Christmas baubles with Hama beads which I have also re-purposed at Easter for our Easter tree. They are based on the square designs above and are really simple to make up. These 3D Minecraft figures are amazing! Even though they look complicated, all you need is a square board to make the pieces which are slotted together, and the finished figures have moveable arms too. You could also have a go at a 3D Hama bead Ocelot to keep them company. I also love these 3D Piggy Banks made from Hama beads, also a great way to make some 3D Minecraft themed blocks. The squares are designed so that they fit together, and should hold in place without the need for any glue. Finally, here you can see pretty much every item from Minecraft, replicated in Hama beads. Many of these would make great magnets or keyrings, or card toppers, embellishments, jewellery - so many ways that you could display them! If your children love Minecraft, you might also enjoy my round up of Minecraft crafts for children. It's been a few weeks since we returned from our most recent cruise, and I'm still dreaming about it and planning the next one. In my experiences of talking to other people about cruising, it seems that most people who have never been on a cruise aren't at all sure about the idea. But once someone has been on a cruise they don't look back, and have booked the next one as soon as they can afford it. That's certainly what happened to us! Waking up when you've arrived somewhere new - it's an amazing feeling to open your stateroom curtains, or head up on deck if you are cruising in an inside cabin, and see that you've arrived somewhere new. Even if the view is of a dirty, busy port rather than an Instagram friendly scene, it's still exciting. Looking out to sea on a sea day, spotting ships in the distance or even better flying fish or dolphins. Being out of touch with the world. Internet access is very expensive on a cruise ship, and although you can usually catch up while in port, on a sea day you are completely out of touch with the world. It's great not to have that constant urge to check notifications on the phone. Dressing for dinner every night. Even if I just put a dress on to eat and then change back into comfy clothes afterwards, dinner tastes so much better if you've made an effort and you can make it into an occasion. On that note, not having to cook or wash up, having a choice of different meals to eat, and trying dishes that I wouldn't know how to make myself. Being constantly entertained, whether it's a show, a variety act, or something simple like a quiz or craft activity. Retiring to a clutter free stateroom, cleaned and tidied for me twice daily, and sleeping in a big, comfortable bed that rocks me to sleep every night. Finally, my favourite thing about a cruise, like all holidays, is spending time with family. Everything is taken care of, there's a full schedule of entertainment as well as opportunities to relax, and you're without the distractions of modern life. For me, cruising is a great way to spend time with the people that I love, and I really appreciate being lucky enough to be able to enjoy these holidays. It's never to early to start thinking about crafting for Christmas! Here's how I turned an old jam jar into a pretty lantern with a wintery silhouette theme. First make sure that your jam jar is clean and dry. Then pour some white acrylic paint into a flat container, for example a margarine tub lid. 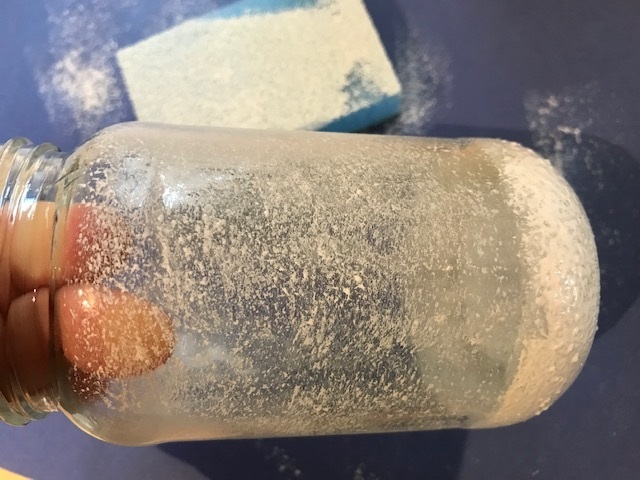 Dip a sponge into the paint, dab off the excess on a scrap piece of paper, then use the sponge to coat the jar lightly in paint, using a thicker layer of paint towards the base of the jar. If you accidentally apply too much paint, use a dry tissue to blot the excess and give the paintwork a smoother finish. Leave to dry. 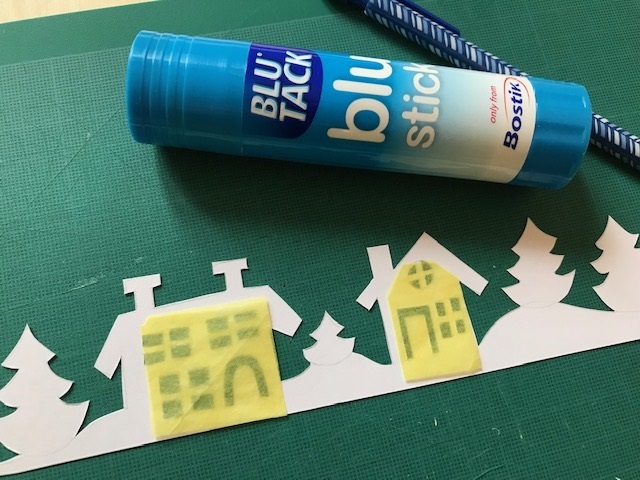 Take a piece of scrap paper and measure around the base of the jar to work out how large your winter scene needs to be. Make a rough sketch of your silhouette. Take a piece of white card and use a pencil to copy your design onto the card. 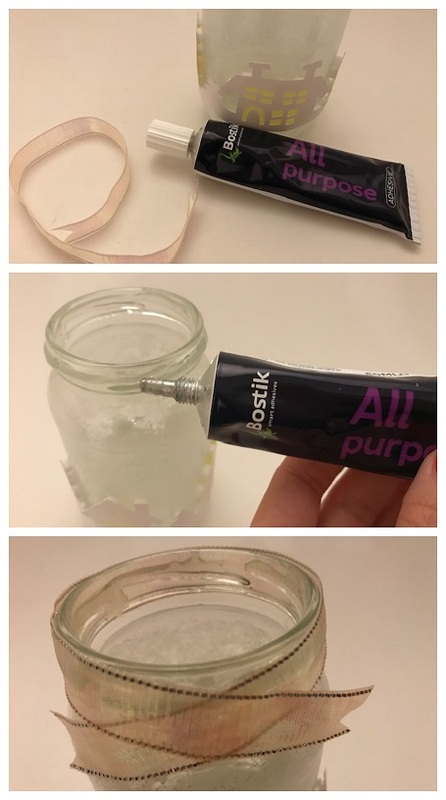 You are working on the back so that the pencil lines will be hidden, so remember that the design will be reversed when it is placed on the jar. 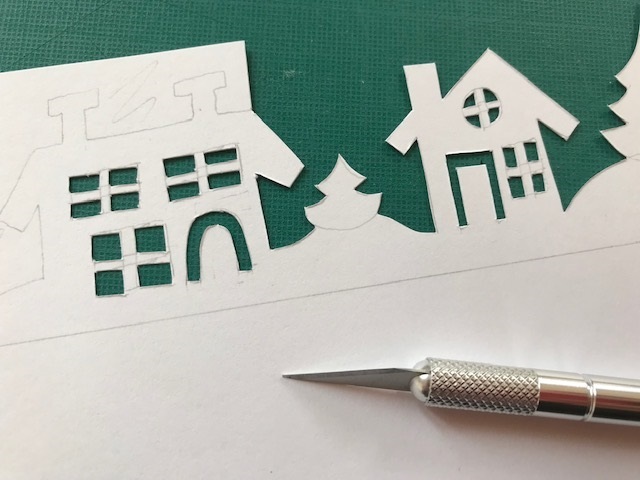 Make sure that your design has plenty of detail, but if you are new to paper cutting don't make it too complicated. 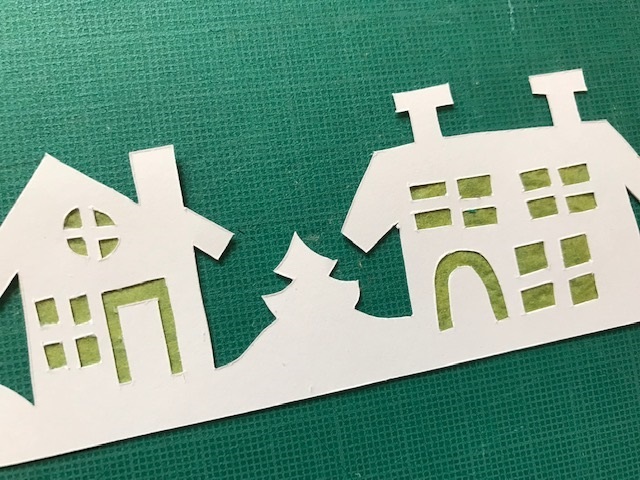 I included two houses with windows and a few Christmas style trees. It might help to lightly shade the areas you want to remove. Then use a scalpel to cut out the design. I found it easiest to start with the smaller more fiddly areas first, like the doors and windows, before making the larger cuts around the outlines of the design. Use a metal ruler to keep the line along the bottom straight. When you have finished the cutting hold the card up to the light to make sure that the composition is even and adjust as necessary. Glue some scraps of yellow tissue paper behind the windows. I used the Blu Tack Blu Stick to glue the tissue paper in place, it's great because it doesn't make the paper wrinkle and because the application is blue you can see where you have spread the glue before it dries clear. 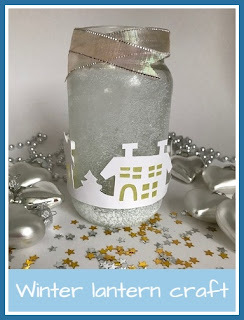 Then use Blu Tack foam pads to stick the silhouette to the outside of the jar. I used the small sticky pads which measure 5mm by 5mm. Because they are so small they can be used for more delicate crafts, and they are very sticky so will hold firmly in place. Finally I finished the jar with some silver ribbon around the top. To glue the ribbon in place I used Bostik All Purpose glue which is great for adhering all different types of surfaces. It dries really quickly too which is always useful when crafting. 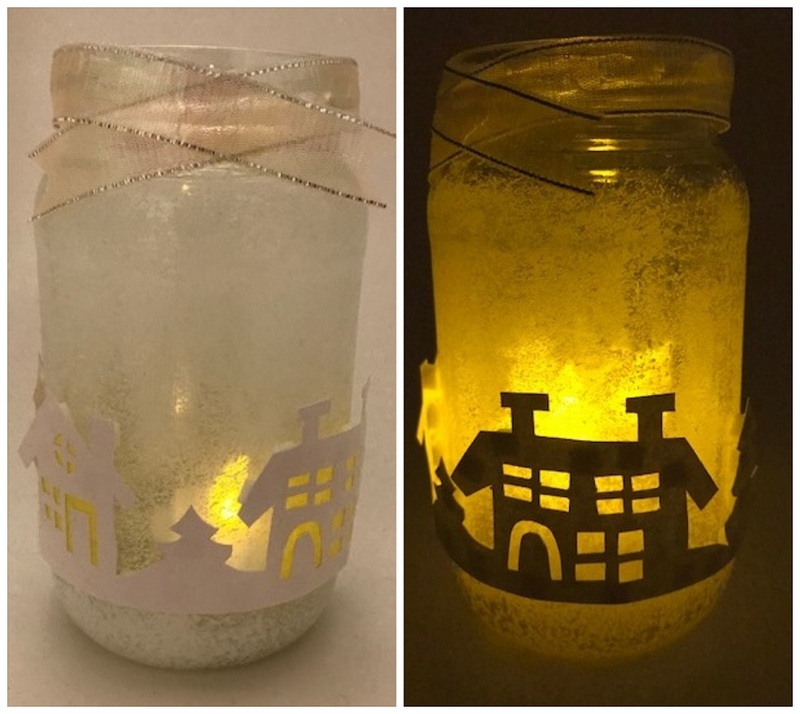 Finally place a tea light candle inside and watch your silhouette come to life! This is a collaborative post in association with Bostik. Today I'm sharing with you some fantastic new books from Carlton Books. They would make some great stocking fillers this Christmas! 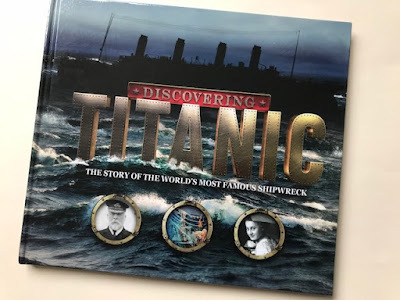 Harry has been fascinated with the Titanic since he was in Reception, so I knew that he would love this new book - Discovering Titanic , and I wasn't wrong. As soon as he saw it he didn't want to put it down! 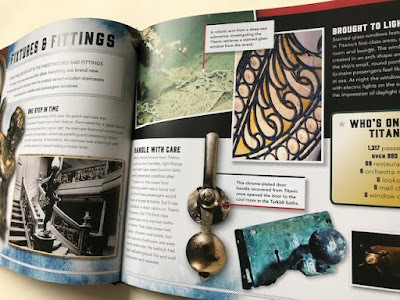 The book tells the story the Titanic disaster, her discovery, and a look at the human stories behind the shipwreck through objects found at the site. I'm quite familiar with the story of the Titanic but there was plenty of information that was new to me, and many pictures that I've never seen before including photographs taken aboard Titanic before she sank which I found fascinating. There is also a great section on the legacy of the Titanic - both the lessons learned and the portrayal of the event in popular culture. It's a really fascinating book, and although aimed at children aged 8+ it's also a really interesting read for adults - a lovely book to look at together with your child. 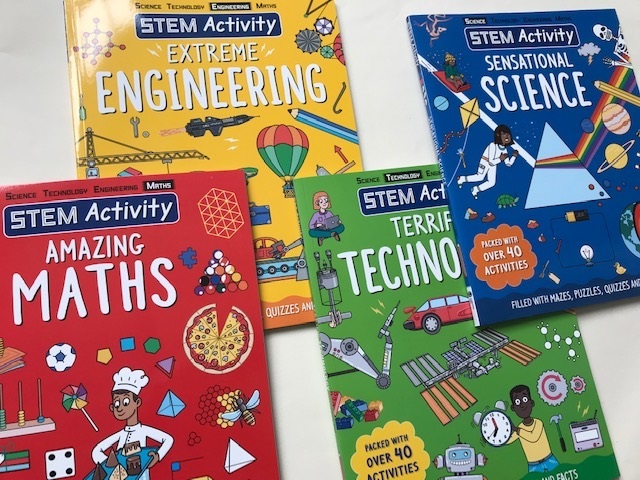 These four books each take a detailed look at a different STEM subject, and use write-in puzzles and activities to engage and entertain enquiring young minds. STEM Activity: Sensational Science is all about atoms, genes, gravity, acids, magnets and plenty more. There are lots of different activities, like completing an electric circuit or colouring in shapes to reveal an x-ray, to help children learn about the different aspects. STEM Activity: Terrific Technology is full of fun activities and puzzles related to mechanisms, robotics, computers, gadgets, space exploration. The technological theories and the discoveries behind them are explained using bite-size fact boxes, and activities like matching the ancient tool to its modern equivalent and helping the plane land at the airport are a great way to help children relate them to their every day life. STEM Activity: Extreme Engineering contains information and facts related to engineering, for example forces, machines, high-tech buildings, eco-energy, computer coding and so on. Activities range from designing a skyscraper and matching the inventor to the innovention, to bring the book to life. STEM Activity: Amazing Maths teaches how to do calculations, shapes, trigonometry and lots more. The activities help children to understand how import maths is in the real world, by working out areas and using map co-ordinates among other things. Harry really loved these books. Some of the activities and puzzles reinforced things that he has been learning at school, as well as plenty of information that was new to him and captured his interest. There's at least one activity to complete on each page, and the activities are really well designed to help children understand concepts and remember what they have read. These books would be brilliant to encourage children to engage with these important subjects. 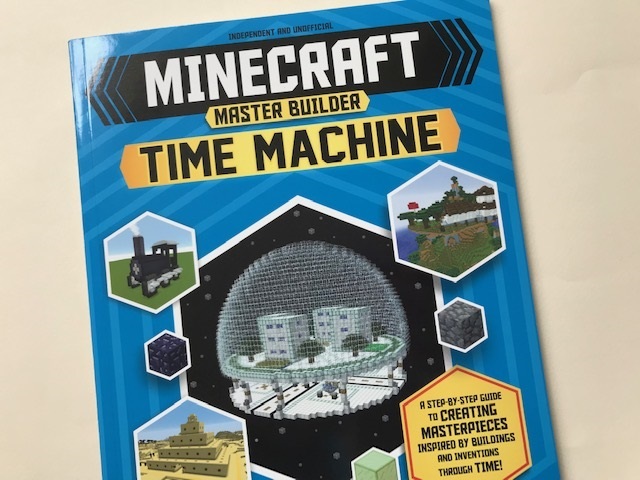 This brilliant book lets you journey through history and create your own amazing Minecraft masterpieces. 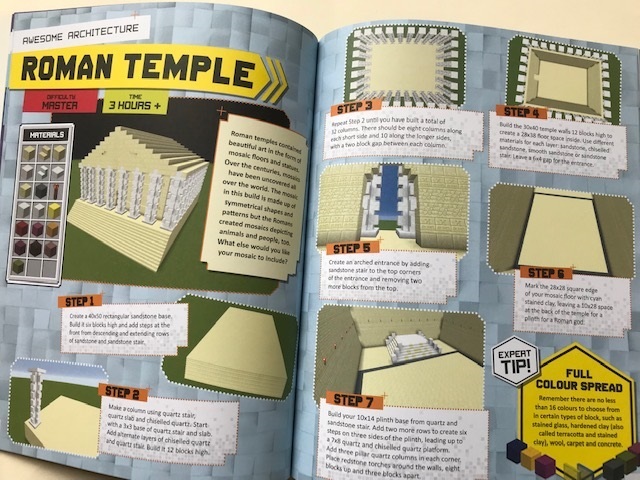 The builds are inspired by magnificent buildings and inventions from ancient times and through to the future, with easy to follow step-by-step guides to help with your construction. There are five different sections to the book - Past Power, Awesome Architecture, Marvellous Machines, Timeless Transport and Future Fantastic - and each features three different builds that are graded by difficulty from Easy, through Intermediate, to Master. Each build is plotted on a timeline from the Pyramid in the 24th Century BC to the 23rd Century Space Base. The very first build is your Time Machine, and there are plenty of hints and tips as you work your way through the book. Even though some of the finished builds are quite complex, the step-by-step instructions are easy to follow. Something that we particularly liked about this book was the way that the builds matched up to the topics that the children have been studying at school. It's a great way to learn about important and famous historic buildings, for example a Roman Temple, Trojan Horse or Tudor Mansion, by taking a close up look at the architecture and building materials used. 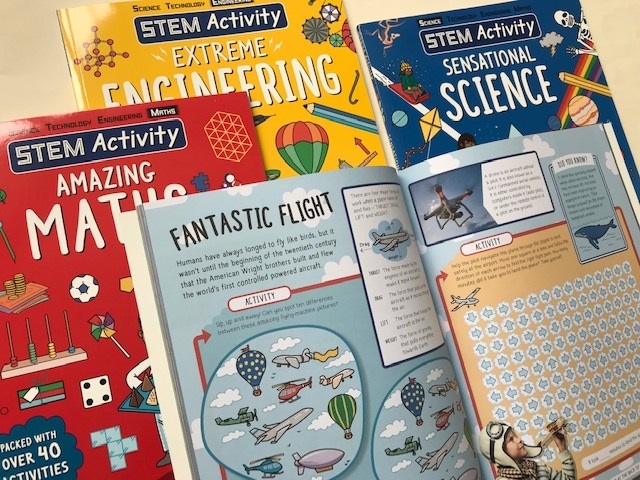 There's also plenty of scope for customising the designs and coming up with your own interpretations, as well as challenges to encourage children to solve problems and use their imagination. For example building their own eco-friendly home for the future. I was sent these books in exchange for a review. Amazon links are affiliate.